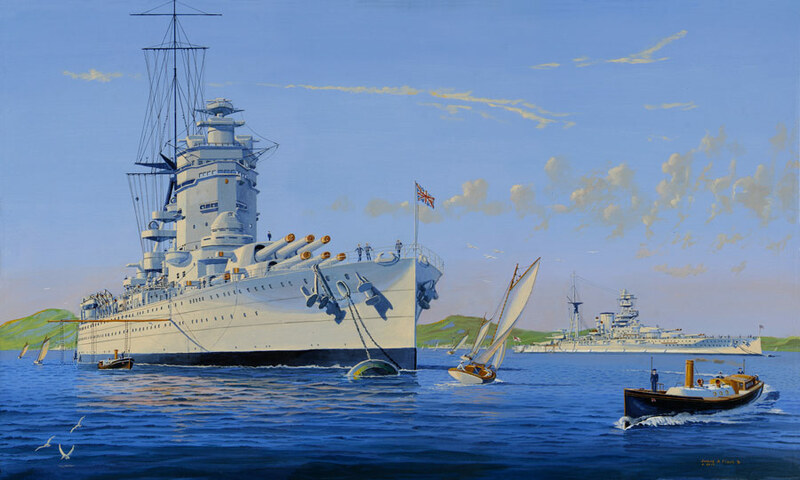 This painting portrays the battleships HMS Rodney (left) and HMS Barham (right) with royal sovereign class battleships in the background at their moorings in Scapa Flow in 1930’s peacetime. Located in the extreme north of Scotland, Scapa Flow was the main fleet anchorage for the British Navy during WWI and well into peacetime. During summers they performed maneuvers with some regularity, as the weather then was usually quite pleasant compared to the winter months where perpetual storms made conditions in the anchorage quite horrific and dismal. The British continued to use the Flow as the main fleet anchorage into and throughout WWII, after which usage was gradually scaled down. In this painting it is summer and Navy personnel can be seen enjoying recreational sailing in small sailboats that were among the collection of competition vessels carried aboard the larger Navy ships. Competitive athletic events were commonly held as they were considered moral boosters for the entire fleet.